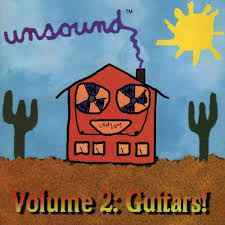 Various ‎– Unsound Volume 2: Guitars! "The Unsound Series exists to make great home-recorded music available to the general public. Some amazing material is being created in kitches and basements all over the world, and it is our goal to see to it that the best of it gets heard. We want to hear your music (any genre is fine) so send us a tape."